Listed below is what I carry, and how I go about doing it. As with all packlists, mine is personal and in no ways definitive. It’s what works for me, taking into account the dirt roads I like to travel and my umbilical chord of electronic gadgets I carry. It’s versatile enough to tide me through frosty nights and toasty days alike. Various items shuffle this way and that, depending on water hauling necessities, expected temperatures, the camera I’m using and whether I burden myself with a laptop. Although my setup is hardly minimal compared to the likes of hardened Tour Divide racers, I pack lighter than most long distance cycle tourists I meet on the road. Choosing to travel light inevitably involves compromises and is mores suited some destinations than others. It means deciding where my priorities lie. Do I carry extra food, or ride longer distances? Enjoy more luxuries, or settle for simpler living? Ultimately though, the reason I streamline my gear to the minimum is to make off road travel more enjoyable – and sometimes even possible. For this, I’ll happily forgo a more comfortable safety blanket in return. There’s a welcome knock on effect too: less weight means less wear and tear on my bicycle. 1 x baggy bike shorts – Endura Singletrack. 2 x quick drying boxer shorts. 2 x thin long sleeve layers, one with a hood – Ground Effect’s most excellent Robin Hood. 1 Patagonia synthetic puff jumper for round the camp. I’m coveting the equivalent in down, for extra coziness and packability. 2 x wool socks. One thin, one thick. So I always have something dry. 1 pair of wool ‘ankle warmers’. Teamed with wool socks, they plug the missing trouser leg gap. 1 x Turtle Fur neck gaitor. 1 x sleeveless cycling t shirt – generally cotton, and cut off. Cotton is comfy but doesn’t wick sweat well – so not to be worn with a backpack. 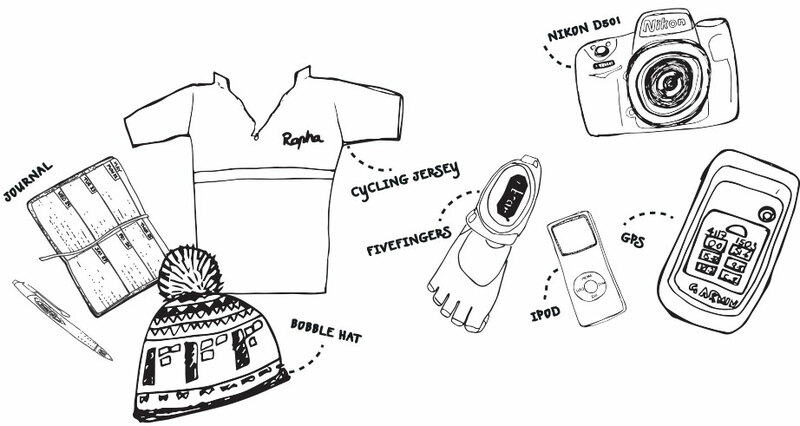 I have a Rapha merino blend cycling jersey I sometimes bring instead. 1 spare cotton t-shirt. For socializing purposes. 1 shirt. On longer tours, donning a shirt is an effective ploy for negotiating officialdom (applying for visas, border crossings etc…). A collar goes a long way. Bike gloves. Mitts if it’s warm, long fingered otherwise. I find mitts more practical for using a camera. Seirus Xtreme softshell waterproof glove. I don’t tend to suffer from especially cold fingers, so these do fine for me. If it’s especially frosty, I’ll supplement them with mitt shells. Sunglasses. Mine are Sunclouds. $50, with comparable optics to pricier sister company Smith. Keen Bryce WP Hiking. I’m experimenting with VP platform pedals at the moment. Wool bobble hat. Fits under my helmet. Buff. Multi-use, nice under a helmet in the morning, or across the face in dusty conditions. 3/4 length Endura waterproof trousers. I prefer 3/4 over full length. I don’t overheat and they cover the parts that need protecting. When it’s been particularly snowy or wet, I wear short gaiters too. Fake Crocs for campsite lounging. Or, Merrell Barefoot Trail Gloves for hiking and running. North Face 30 degree sleeping bag. A Western Mountaineering bag is on my wishlist. Vapour Barrier Liner. Packs tiny, yet boosts the efficacy of my sleeping bag for light winter use. Thermarest Neo Air. Super comfy, with a super compact packing size. Tarptent Moment. Light and freestanding. Tyvek groundsheet. Cheap and very light. Fold-flat camping bowl. Doubles as cutting board. Penknife with blade and can opener. Large zip lock bags for food storage. Bottle of iodine drops or packet of purification tabs. I generally drink local water, so rarely have needed a water filter – though the SteriPEN Freedom would be ideal otherwise. Dr Bronner’s peppermint soap, 59ml bottle. Bottle of iodine. Good for cuts, and for purifying water. Some ibuprofen. Just in case. Note: My medicine cabinet is pretty light. Most places I tour – Asia and Latin America – have everything readily and cheaply available, over the counter. I’m prone to chest infections, so I sometimes carry some chinese medicine for that, and amoxycillin if things get really bad. Duct tape doubles up well for sealing deep gashes. Travel documents. Plus photocopies, particularly visa entry stamps. Backups are photographed and stored online too. Printed photos. Good ice-breakers in far-flung destinations. 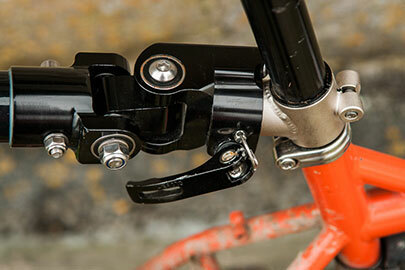 Abus Combiflex cable lock. Very light. An immobiliser rather than a secure means of locking my bike. When I’m not camping, the bike comes with me into a guesthouse room. Junk strap. In case any buckles break. Preamble: Although there’s a definitel appeal in a simple, decent quality Point ‘n Shoot, I enjoy more creative control with my photography, and have invested in good quality lenses over the years. I alternate regularly between two camera setups. The first mirrorless option is light and compact – it’s pretty much ideal for bikepacking. The second DSLR option is bulky and heavy but offers better IQ and in my case, lens variety – based on what I already own. Panasonic GH2. 14-45mm f/3.5-6.6 lens (28-90mm equiv), 20mm f/1.7 (40mm equiv) prime and 45-200mm f/4-5.6 (90-400mm equiv). Discreet, small and light. I miss fast lenses for depth of field control, plus the lack of wide angle. Canon 6D. 24mm f/2.8, 40mm f/2.8, 70-200mm f/4. Fantastic low light quality, depth of field control and battery life. Impractical size and weight. Note: I’m considering selling my DSLR gear and invest in an updated mirrorless camera, like a Olympus OM-D. As such, my dream lens lineup would thus stand as follows: Olympus 9-18mm (18-36mm equiv), Olympus 12mm f/2 (24mm equiv), Lumix 20mm f/1.7 (40mm equiv) and Lumix 35-100mm f/2.8 (700-200mm). This setup would offer the variety and most of the optical quality of a SDLSR, without the heft of a DLSR. Spare CF or SD cards. Card reader and extra short USB cable. Lens wipe and Giotto Air Rocket Blower. iPhone 5, plus cable. Wifi, music, Googlemaps, backup camera, guidebooks and a whole lot more. Garmin eTrex 20 when needed, otherwise I use the iPhone as a GPS. Mac Air 11in. Svelte, light and amply powerful for photo editing. Lives in a homemade padded case. WD My Passport 2TB. A reliable hard drive for backups, stored in water tight zip lock bag and padded sleeve. I choose my favourite shots and back these up onto a 64GB flash drive, hidden in my framebag, sending copies home when possible or uploading to Drop Box. Petzl head torch and rear bike LED. Note: All my fancy electronic gear is masked with electric tape for both protection and a worn in, logo-free look. 2 x 29” tubes w/removable cores, Topeak multitool w/chainbreaker, Leatherman Squirt (includes pliers and scissors), 2 x water cage bolts, chainring nut and bolt, spare SPD cleat and bolts, tire boot material, patch kit, extra patches, tyre lever, gear cable, brake cable, 2 sets of BB7 brake pads, Fiber Fix spoke, 1 spare spoke of each length, around 6 extra chain links and 2 extra Sram Powerlinks, a few zip ties, Gorilla tape wrapped around pump, Topeak Master Blaster pump. Small bottle of lube. Rag. Note: If I’m using my Rohloff, I carry 2 spare Rohloff torx bolts, a TX20 key and a Rohloff sprocket removal tool. I’ll also pre-cut 2 gear cables to the correct length and dab the ends with superglue, to save sourcing a high quality cable cutter. 1 x emergency tyre for longer trips or extended road sections. The light, folding Marathon Dureme 29 x 2 is perfect. Porcelain Rocket custom frame bag. 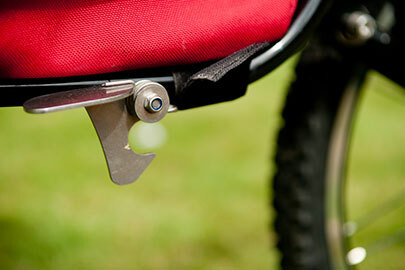 A key component to travelling without panniers, especially if you have a large frame. Porcelain Rocket top tube pack. Stashes a multitool and snacks. Porcelain Rocket Mission Control handlebar roll bag. Within, a 10L Outdoor Research waterproof roll bag keeps things dry. Porcelain Rocket front accessory pouch or Ortlieb bar bag. I’m still dissatisfied with how I pack my camera. An Ortlieb bar bag offers the best monsoonal protection and is easiest to quickly remove from the bike, but it’s bulky and tends to encourage the camera to rattle around over bumpy descents. If I’m using my M4/3 setup, the PR front pouch works fine, supplemented with a small dry bag when needed. Carradice Super C saddlebag. I’ve been very happily using a PR Booster Rocket seat pack for a while, but I’m currently experimenting once more with a traditional saddlebag, supported by a Bagman 2 Expedition. The advantage of this setup is that it fits my laptop, without the need to carry panniers or a backpack. The downside is that the Carradice/rack combo is heavier than a modern seat pack, and isn’t quite as stable – some modifications may be needed eventually. REI Flash 18. Rolled up while touring. Good for around town, day rides, or to tide me over if extra food is required. Note: In bikepacking mode, I can carry 4l of water easily, with more in the framebag if required. Profile Kage bottle cages. On the fork legs. Light, strong and grippy. Ti Triple bolt King Cage (custom). Under the downtube. 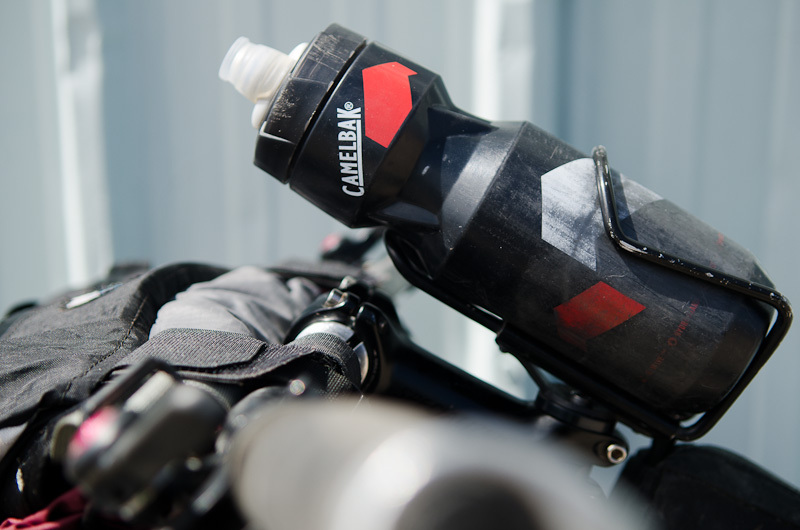 Holds a 1.2L Kleen Kanteen bottle snuggly. King Cage Top Cap Cage Mount. If extra H20 is required. Note: The Surly Ogre I have been riding includes eyelets on the fork for extra water bottle cages. This has become a valued part of my setup. When these are lacking, I use hose clamps. The bikepacking setup I run reflects the fact that I like to ride backcountry dirt roads, and even singletrack where possible. My gear is distributed across the bike and is relatively light. However, it only realistically allows me to carry 3-5 days of food, unless I wear a backpack – which I prefer to avoid. Generally this has proved to be ample, but there are times when the ability to haul more cargo is preferred. If I’m anticipating riding longer distances between re-supplies, or helping out a riding partner, I have the option of fitting a rear rack and two small panniers, or pulling a trailer. I tend to prefer the latter, despite the extra hardware involved and the associated logistical challenges it can sometimes pose. 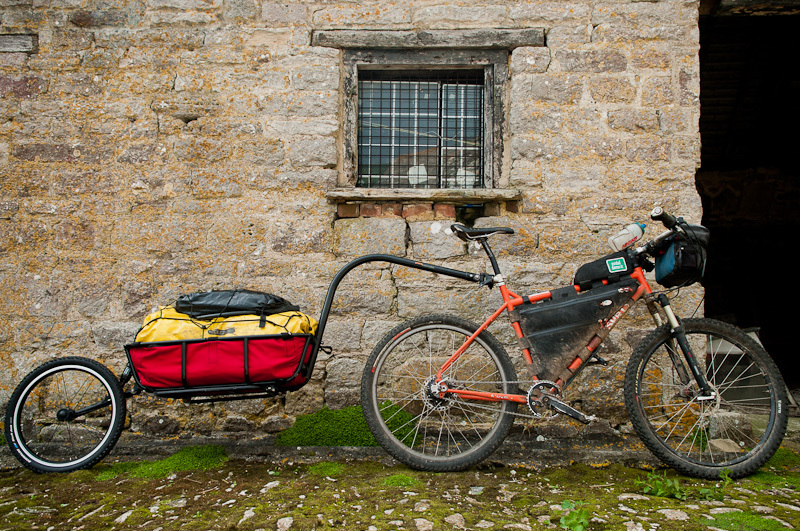 A single wheel trailer – my favourite is Tout Terrain’s Mule – gives me the capacity to carry ample food and share the payload with a cycling partner. It saves wear and tear on tyres and wheels, and keeps the bike fun and spritely to ride on mountain biking day trips. It’s also especially easy to pack. The Mule handles nicely, it’s built with an incredibly high attention to detail, and I particularly like its kickstand – more thoughts on it here. I generally team it with a framebag for easy access to snacks/layers/camera lenses and an Ortlieb bar bag. I still often pack my soft bikepacking gear for ultralight, mountain biking detours. There’s a whole bunch of cool stuff on the market. This is some of my favourite gear, suiting both my ideals, and my style of dirt-road touring. It’s always interesting to see how other people do things. 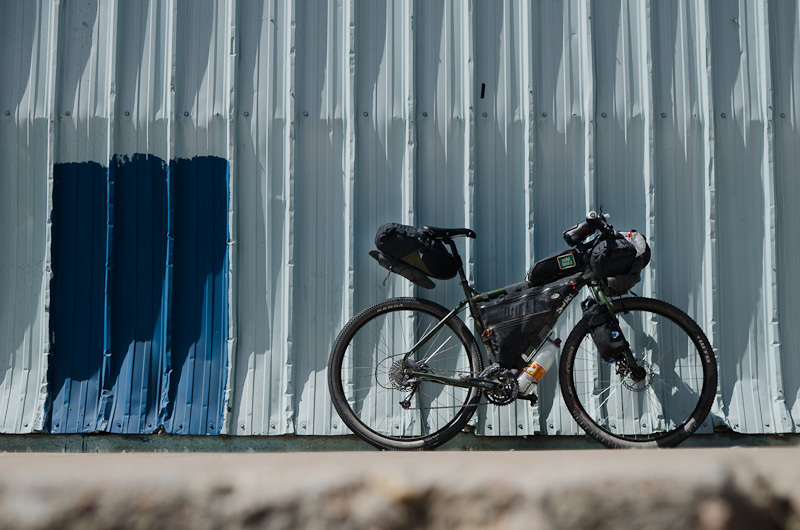 A previous post I wrote on travelling Lean and Light, with the various weights of bikepacking bags compared to racks and panniers. Joe’s multi-month ultra minimal South American packlist. Gary’s setup is considerably lighter than mine; some useful notes on tubeless touring. 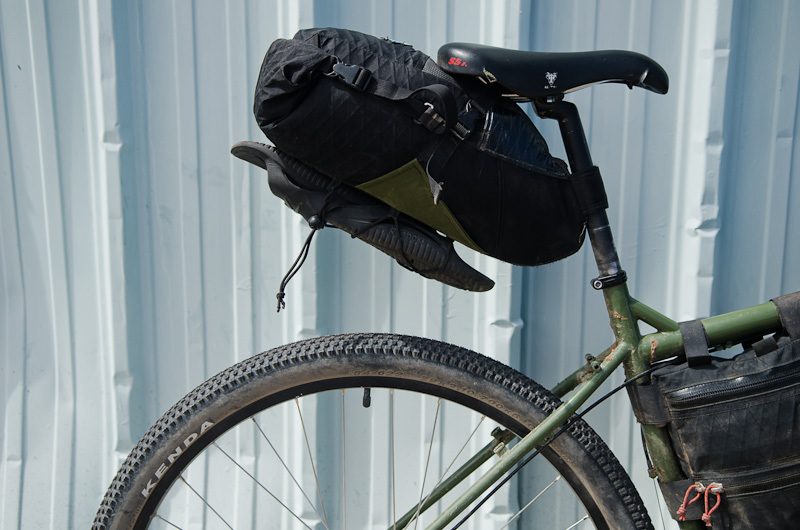 Gypsy by Trade, a proponent of saddlebag bikepacking. Round the world record holder Mike Hall.